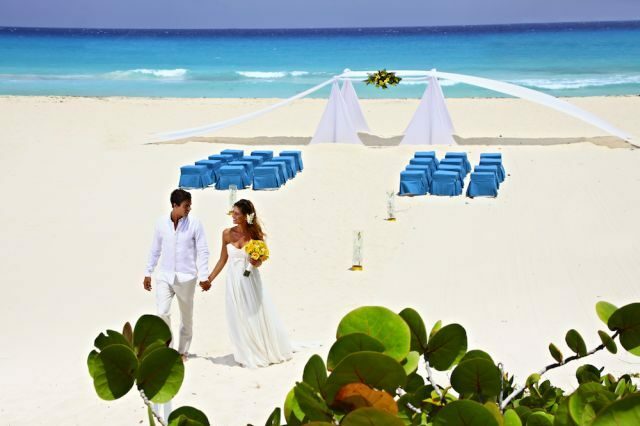 The Sandos Playacar Beach Resort is just 15 minutes from the vibrant town of Playa del Carmen. 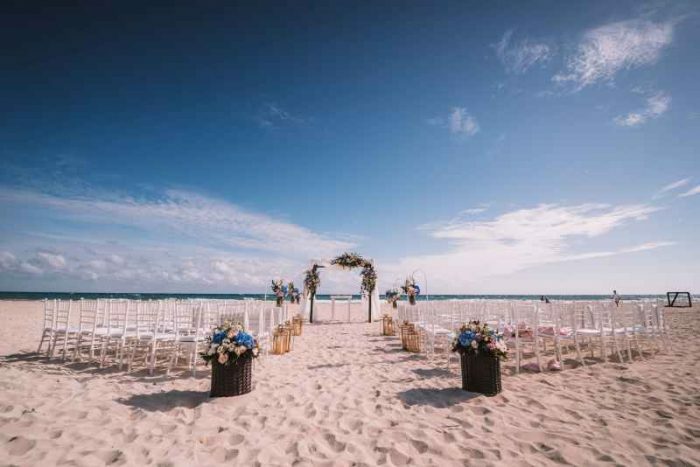 Its unique location, nestled on a long stretch of beautiful, white sandy beach, allows for a more private, intimate beach wedding ceremony with breathtaking ocean views. Wedding guests will enjoy the four major resort areas, including one that’s adults-only. Beyond the wedding festivities, there’s plenty to enjoy, including over 9 pools to explore, a sweat lodge and full-service spa, and even a mini-eco park on site to get close to the local wildlife and vegetation. 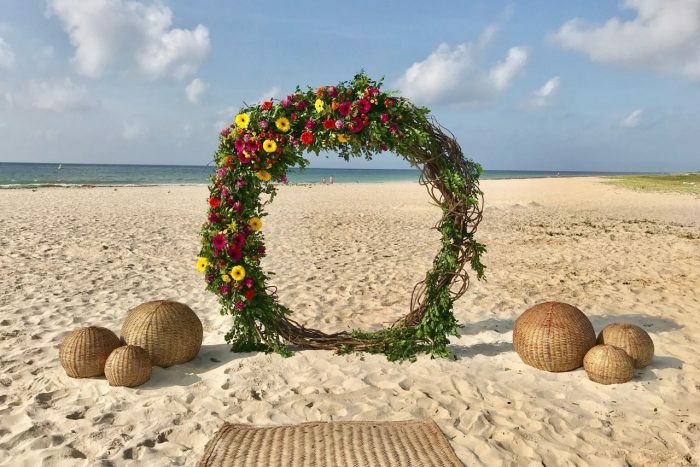 Sandos Playacar’s private beach location is highly recommended if you are looking for a quiet and intimate destination wedding with beach ceremony. 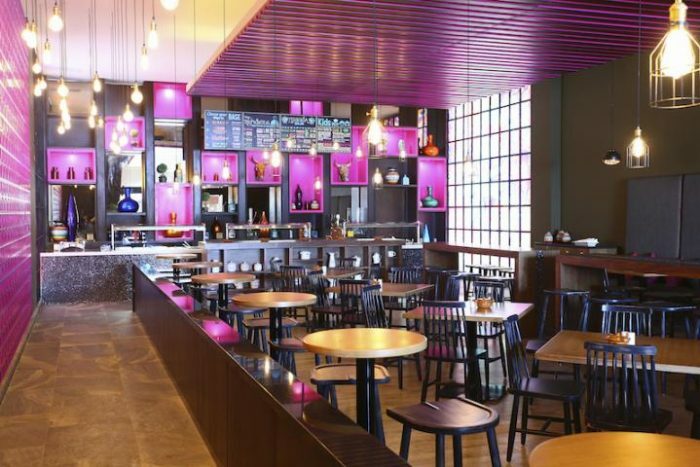 For a unique dinner rehearsal, or even reception, book a group table to the Brazilian Rodizo restaurant. This resort is also home to local wildlife, don’t be surprised when you find a monkey lounging on your balcony or if you cross paths with a peacock! The base package is $2990 and includes 30 guests. Upgraded packages, additional guests, and add-ons are available for an additional cost. Package price is discounted to $1990 if you book at least 30 rooms for 3 or more nights. 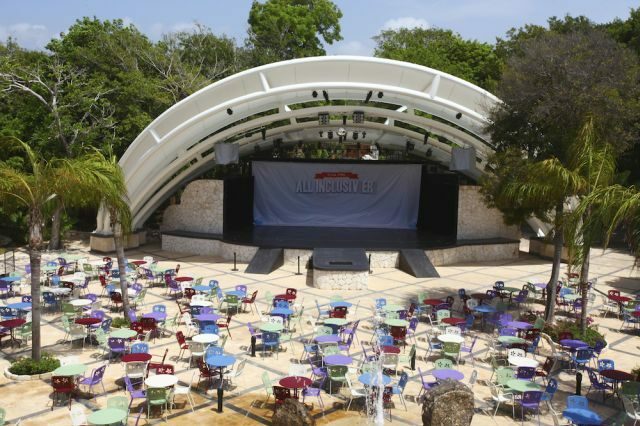 Garden – 100 guests max, Oceanfront Gazebo – 100 guests max, Beach Canopy – 100 guests max. 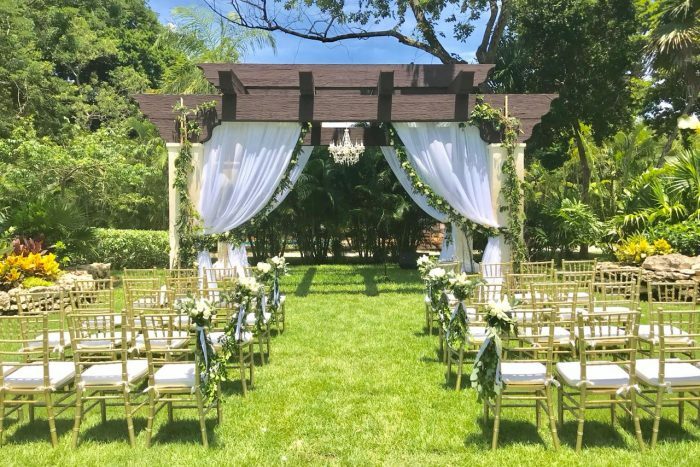 They typically host only 1 – 2 weddings per day, but they can have up to 3 per day at different times and in different venues. They typically respond within 24 hours. During peak seasons, you may have slightly longer response times. 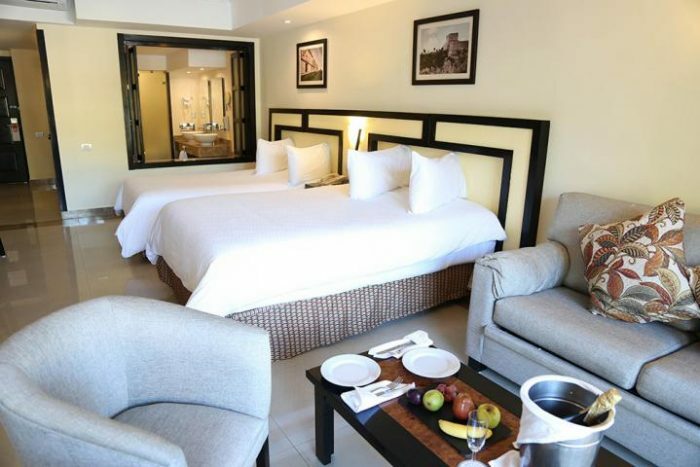 Prices range between $110 – $200 per person per night depending on the time of year. 819 Rooms divided into four sections, including an adults-only section. Offers garden, pool, and ocean front views. Recommended for guests who want to be close to town and want a more active resort. December, January, April, May, June, July. It’s always encouraged to have your guests book early. The resort can sellout during peak seasons. 3 adults and 1 child or 2 adults and 3 children. Children over 12 years are considered adults. Larger families may need to book 2 rooms. 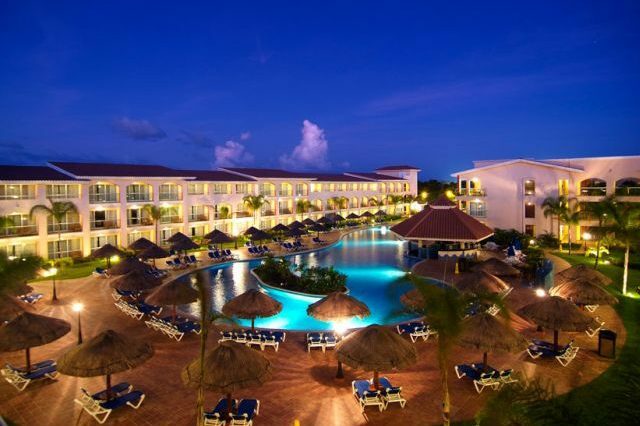 This resort is located 37 miles from the Cancun airport. There are 819 rooms divided into four sections, including an adults-only section. Offers garden, pool, and ocean front views. Recommended for guests who want to be close to town and want a more active resort. 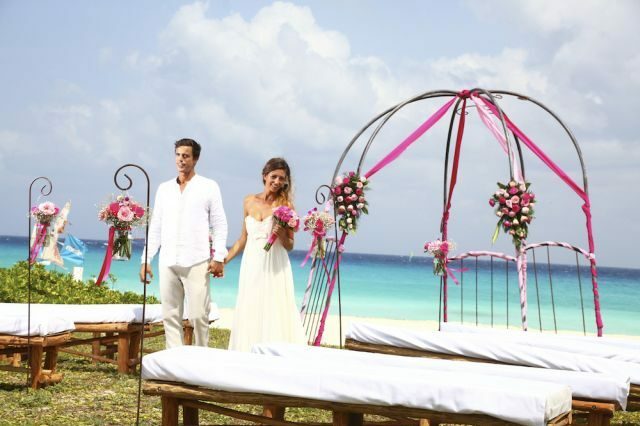 Q: What makes Sandos Playacar a great place for a destination wedding? 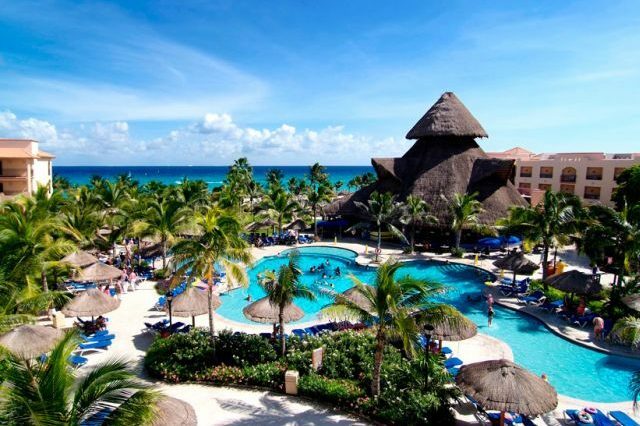 A: Sandos Playacar is a very family-oriented resort and specifically offers a lot of activities for teens, which many other resorts are missing, however the Select Club adults-only section also offers a nice retreat for adults. Every guest, no matter the age, will have a wonderful time at Sandos Playacar. 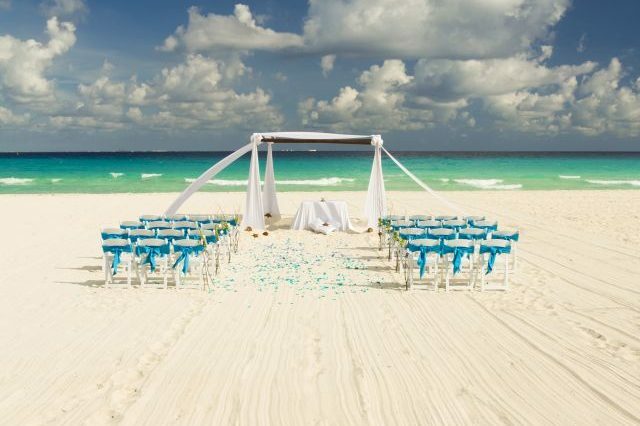 A: My personal favorites are the beach ceremonies. We also host a variety of beautiful wedding locations, both outdoor and indoor. 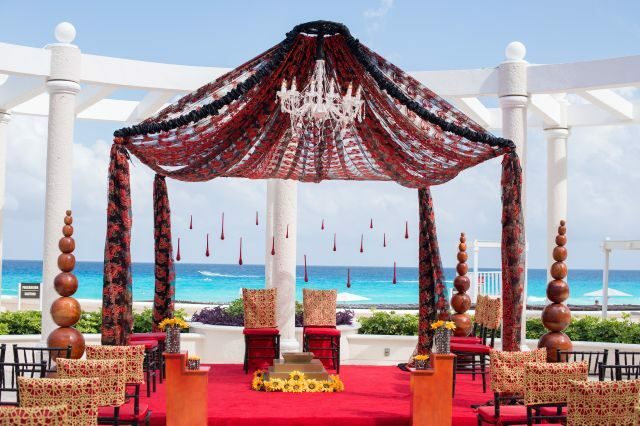 Q: How many weddings have you coordinated at Sandos Playacar? A: ALL OF THEM! We make wedding planning as easy as possible. From the very first moment of contact, we will present you with all of your wedding options and the date we have available. We are here to support and celebrate you on your special day! Overall I recommend this hotel.